for my latest “get off the couch” game i decided to revisit the original wii sports, a game that, due to the success of wii, has ended up being one of the best-selling video games of all time and in the 8 years since its release has become something of a classic. when i’d sat down with the game about five years ago (!) (figuratively speaking, since then as now i’d actually spent most of my time playing the game standing up) i’d spent most of my time playing the three tennis training games and hadn’t actually spent much time with the other four sports. this time around the first tennis training game was still my default activity (although, sadly, i never did quite make it to the platinum ranking), and it’s kind of surprising how just compelling and addictive that one minigame is. the pace of it is somewhat frustrating in that the serves alternate between groups of them being close to vs. far from the net, and returning balls close to the net can require some luck. but the thwack of each hit you return with your virtual tennis racket is extremely satisfying, and it’s easy to get into a zen-like state of returning serve after serve after serve. i was happy to find that tennis was enjoyable as i remembered (and my forehand definitely improved as well, haha). although i would’ve been perfectly happy playing just that one tennis training game, i did spend about half my time playing around with the other four sports, mostly via their training modes. i didn’t spend much time with baseball since swinging the bat felt rather too similar to tennis, and try as i might i still haven’t developed the right knack to do well in bowling, although i did feel i was slowly (veeeeery slowly) improving. 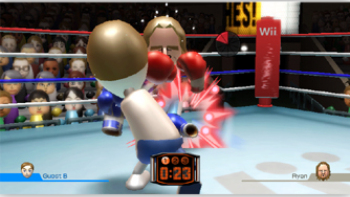 golf was pretty fun, although it seemed much more about trial and error than developing any skills and it was rather slow paced, so in the end i spent most of my non-tennis wii sports time playing boxing. in my previous post about the game i reflected on how magical wii sports seemed when it first came out, and although the novelty may have worn off, it’s somewhat surprising how much fun the game still is today. this game is practically synonymous with the wii console itself since they were released together, and back in 2006 it represented something new and fresh and inclusive: that graphics don’t matter, and that even simplistic, “family friendly” gameplay can be tremendous fun. once again nintendo made creating fun experiences look completely effortless, and wii sports‘ and wii’s impact is still felt today, and will continue to be felt far into the future. the impact of the game and the solid, timeless gameplay led me to bump this up from my original rating and add it to my “greatest games of all time” list. although i’ll be playing its wii u remake before i get back to this one, i’m sure when i come back to it years from now the original will be as enjoyable as it is today. Completely agree with you, Wii Sports is surprisingly deep. My family still play Wii Play occasionally to this day for the exact same reason!